I haven’t been blogging regularly recently – I’ve been distracted by other things – and I’ve decided that I need to fix that. However as I’ve been busy during my working hours, I decided to resurrect something from early in the life of this blog – an accidental recipe. So often, as you work on digital transformation, the end goal changes as you progress. You start off thinking you will end up in one place, but you learn and experiment as you go, and sometimes what comes out of the other end is much more wonderful that you expected at the start. True transformation often emerges, rather than being designed (we give the name Design Thinking to a process that is not really about designing to an end goal, but designing as you go – so you really don’t know what the endpoint is until you get there). Tonight I had an idea for dinner. Fish baked in the oven and using up the new potatoes and large beefsteak tomato that I had in the cupboard. I bought a cod tail from the fishmonger (though you could do this with any solid white fish) and looked what else he had around – some shallot onions would help, a small fennel, and the herb section included a bunch of Dill which seemed promising (may thanks to Sandy’s the fish shop in Twickenham for both inspiring and providing the key ingredients for this meal). Now any of you who have worked with me on social adoption projects will know that I start with known frameworks that work, and tons of experience, and make the rest up as I go along (depending on the emerging business needs and the evolving culture of the participants). I cook the same way. Clean a couple of handfuls of new potatoes and parboil them for around 15 mins. Meanwhile, I used a Le Creuset casserole pot to cook the dish, on the hob and then in the oven. Lightly fry 2 or three shallot onions (finely chopped) with a chopped garlic clove in a little olive oil for a minute. Add a small fennel (sliced) and fry for another minute. Throw in a roughly chopped beefsteak tomato (or whatever tomatoes you have to hand) and half a bunch of Dill (I used just the leaves and left the stalks behind). Sprinkle with black pepper and stir together. Add a small Cod tail (skinned) to the pot in largish pieces. Add a splash of white wine. Thickly slice the parboiled potatoes and spread on top. Cover and transfer to a preheated oven at around 180 degrees. After 15 mins, remove the lid and spinkle with good covering of parmasan cheese. Continue cooking without the lid. After a further 10 minutes, transfer to under the grill (I have a combined oven/grill so I could just switch it to grilling). It was one of those times when I really didn’t know how it would turn out, but it seemed like a good idea. And the result was amazing – the potatoes really absorbed the flavours, especially the Dill which made the meal very special. Whether you are transforming organisations or cooking dinner, there is nothing quite like exceeding expectations! Three years ago I was invited to meet with a local authority to discuss advanced collaboration. They had just been informed that the council’s head office was to be sold, so they had to find ways of enabling a workforce that was used to being “in the office” to do their jobs effectively from distributed locations or from home. This required a cultural change as well as new working practices, so new collaboration tools that can help users to make this transition would be key to success. Recently I was invited to present on “Socialising your Intranet” at the National Communications Academy Scotland event for Scottish local authorities, so I contacted the council to discuss how their project had gone and whether I could use them as a case study. It was great to hear their excitement about the journey that had been on over the last few years. From the start, support from the Chief Executive down had stronger than they expected and they had actively engaged managers and team leaders to become agents of change in their organisations – resulting in over 50 use cases being implemented already, from better supporting community hubs, to transforming the registrar processes, to improving traffic flow on the roads. The final value was much greater than simply facilitating the move from fixed desks to remote and home working that had been their starting point. A colleague and good friend, Louis Richardson, likes to explain how much easier it is to sell someone a headache pill rather than a vitamin pill. Sure, vitamins are good for the body, but if you can help to get rid of someone’s headache they will be much more committed taking the medicine and making the changes needed for success. In this case, the urgent need to move to distributed working was the first reason to act, but then using middle management (so often inhibitors for change) as the driving force for a new way to work was a brilliant way of finding more headaches – and curing them. So what are the headaches your organisation faces? 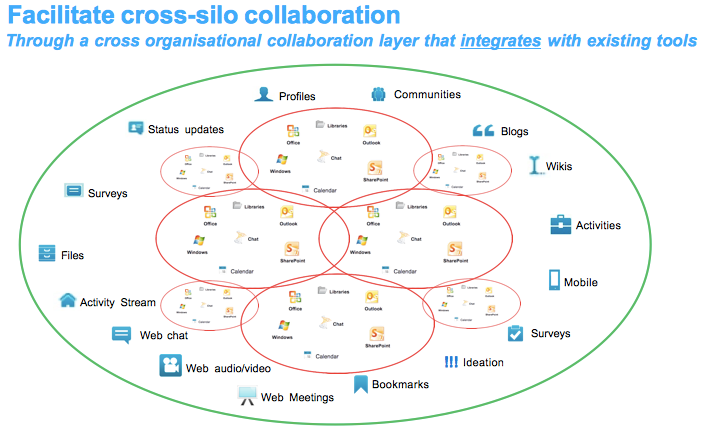 Could better collaboration tools and techniques help to address them? Finding a new way to work has helped many organisations become more agile and adaptive in a changing world. Could you transform your organisation into a more satisfying, more successful place to work. A new generation of tools have emerged in the last decade that can empower smarter workforces to come together to create more effective and efficient organisations (what IBM terms “social businesses”) by supporting social collaboration. This isn’t just about adding a few new features to existing collaboration tools, it’s about a new engagement platform (in the same way that Facebook on the public Internet provided a different form of engagement to previous social media tools, like blogs and wikis). If you like, it’s a shift from social media to social networking (although the need for social networking in the enterprise still hasn’t been accepted by some, so we’ll stick with social collaboration for now). In an AIIM white paper, Geoffrey Moore articulated the difference between Systems of Record (i.e. structured data or unstructured documents and the processes we put around them) and Systems of Engagement (i.e. the way people interact with each other to execute processes), but some organisations still don’t understand or are unwilling to accept the need for different tools in these different worlds. It’s not helped when those passionate about social tools talk about them as if they are a replacement for existing collaboration tools – whether it is predicting the end of email or decrying existing team focussed collaboration tools as inevitably creating information silos. 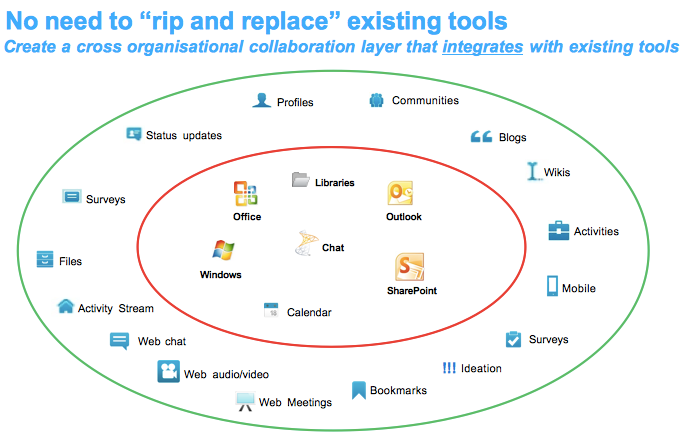 The answer, they seem to say, is to replace them with a new set of tools enabling a different sort of collaboration. To my mind, this ignores several realities. First, existing tools do what they were designed to do, usually pretty well. Secondly, the content that currently resides in them, and the established processes built on them, make their removal difficult. Finally, their users understand how to use them, so they tend to see them as the natural solution to challenges they face – and changing that behaviour takes effort, requires motivation, introduces a level of risk, and needs to be done collaboratively across different groups of people (which isn’t something the current tools support very well). I believe that the reality is that we need new capabilities that complement existing collaboration tools, not replace them. However this is not just about adding a few new features to an existing collaboration platform. Systems of engagement are different to systems of record. Indeed, the difference between an effective social collaboration platform and, say, a team collaboration platform like SharePoint, is as large as the difference between SharePoint and an email platform like Exchange. Providing enterprise wide social collaboration doesn’t mean that the need for inter-personal messaging or team projects goes away. While I would expect usage of existing tools to decline as interactions and processes start to move to using the new tools instead of the old, many proven and effective ways of working, and the processes they use, will not change quickly. This can be hard for IT budget holder as they need to justify the cost of adding new tools, rather replacing existing ones. Which is why they would like to believe that adding an enterprise search tool, a basic profile page and some activity streams to an existing team collaboration solution will allow it to be used for enterprise wide knowledge and expertise discovery. 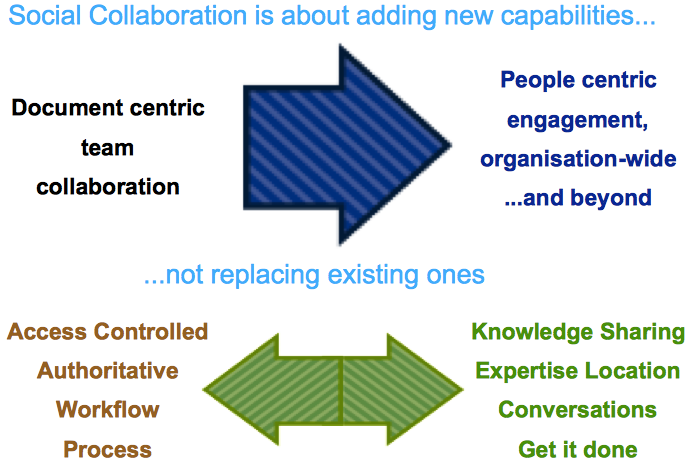 It’s easier to go into denial about existing tools proven tendency to create knowledge silos, stifle innovation and prevent information from flowing across organisations, than it is to accept that existing tools need to be complemented by a people-centric fabric that can bind an engaged workforce together, aligning its efforts to efficiently and effectively achieving the organisation’s goals. My vision of social collaboration is that it integrates existing collaboration tools, content repositories and business applications – as well as providing a new set of social media content types. 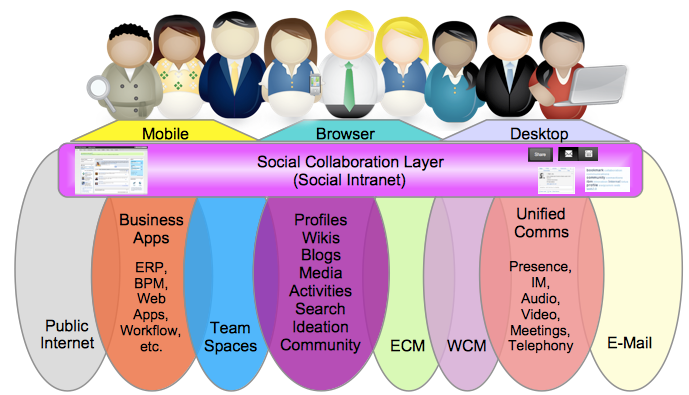 The key to an effective social collaboration layer is its ability to deliver social networking that integrates social networking and media with existing existing systems and documents. Integration with existing tools (both the personal and team productivity tools) helps users to migrate to these new ways of working at their own pace, minimising risk and letting organisations focus on the areas of maximum return. IBM naturally integrates its IBM Connections platform with its own email and team collaboration platforms, as well as open source solutions like OpenOffice and Sugar CRM, but it does just as good a job of integration for enterprises deploying Microsoft Office, Outlook and SharePoint – and with its commitment to continue supporting Connections on premises as well as in the cloud, all organisations can benefit from IBM’s social business prowess. This has significant advantages, not least in avoiding the costs associated with replacing existing tools and the risks associated with changing working processes – whilst still delivering the benefits of social engagement across the workforce. Indeed, it can allow organisations to unify existing information silos by letting employees find information in multiple, existing repositories and collaborate effectively with users in remote parts of the business. Furthermore, a social collaboration solution like IBM Connections, with its visitor model that provides selected external users with carefully controlled, secure access to just the parts of your enterprise social collaboration platform they should be allowed to use, let’s you break down the ultimate collaboration silo created by your corporate firewall, enabling you to work closely with partners, suppliers and customers to better deliver your organisation’s goals. The steps this illustrates represent the pragmatic evolution of the sort of tightly integrated, monolithic organisation we created in the 20th century, to the federated, agile, adaptive organisation that is needed to thrive in the 21st century. Through a genuinely smarter workforce. Thanks to Mark Fleming for recommending The Power of Habit by Charles Duhigg to me earlier today, and reminding me of Charles’ TED Talk on the topic. I often talk about the key to social collaboration adoption being changing people’s behaviours, so it is important to remember that most behaviour is driven by habit. Changing those habits is often the biggest challenge in social adoption. As the video shows, when employees are carrying out habitual processes, doing what they always do, the are effectively asleep as far as actively helping the company achieve its goals is concerned. In his book (though not the video), Charles talks about how Paul O’Neill, when he was appointed to be the new CEO at Alcoa, focussed on changing employees around health & safety and in turn was able to drive the other changes to processes necessary to transform the company. 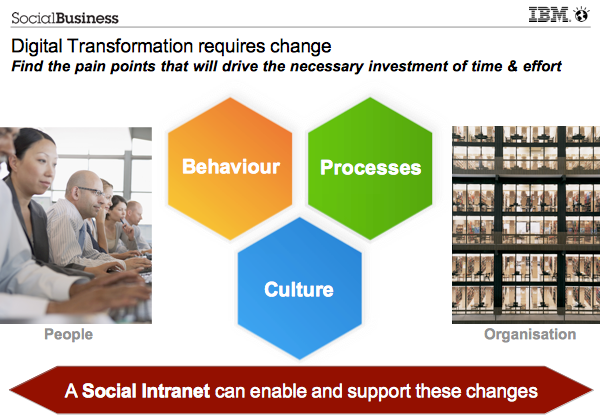 So, when you are building a social adoption plan, don’t just think about the behaviour changes you need employees to make, but think about how you are going to help them to change the habits that drive their current behaviour. These complement the Special Report IT Pro published recently with IBM on Are You A Social Business. While on the topic of IT Pro, they have a couple of relevant articles on this topic on their web site in which I am quoted: Going social: implementing a social business strategy and The importance of compliance in social business. Much of this content is also available through the Cloud Pro web site. In October I presented the opening session “What is Social Business” in the Social Business track at IBM BusinessConnect in Twickenham. The video of that session has now been posted to YouTube. It provides an overview of the business benefits of adopting Social, Mobile, Analytics and Cloud technology in organisations. Earlier this year, I published the article linked above on the Personnel Today web site discussing the role of social collaboration in identifying future leaders, developing them and realising their potential. A source of frustration for many current leaders is their inability to communicate corporate strategy to every employee and engage them to align what they do every day with those goals. At the same time, succession planning and capitalising on talent is a priority for many businesses today. By focussing on building employee networks and relationships to create an engaged workforce, social businesses create an environment where a new breed of Social Leaders can emerge with a high level of insight about how the business works, and an ability to influence and lead that goes far beyond what was possible before using typical management hierarchies. Are we still talking about Tags or Taxonomies?